A pictorial walkthrough Manage students Manage courses Manage AVETMISS. 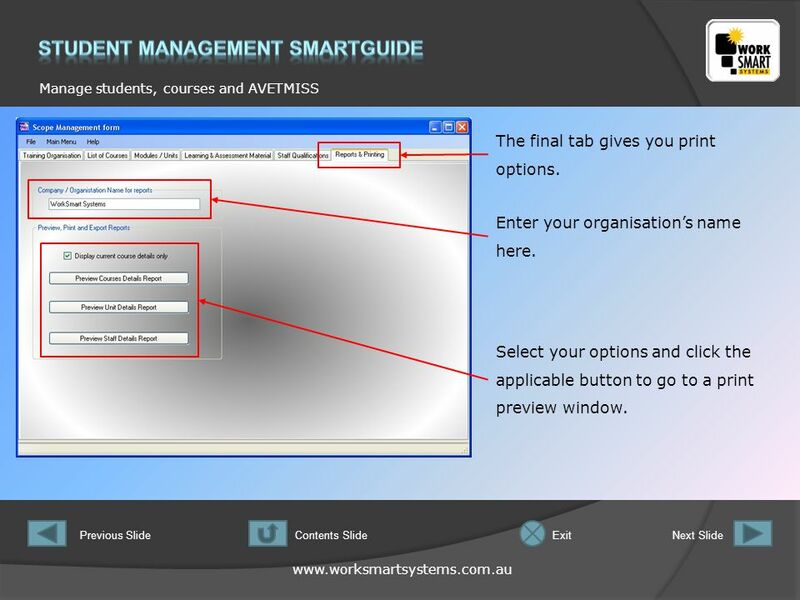 3 www.worksmartsystems.com.au Manage students, courses and AVETMISS Previous SlideNext SlideContents SlideExit After installing the Student Management SmartGuide you will see the desktop icon for the program. 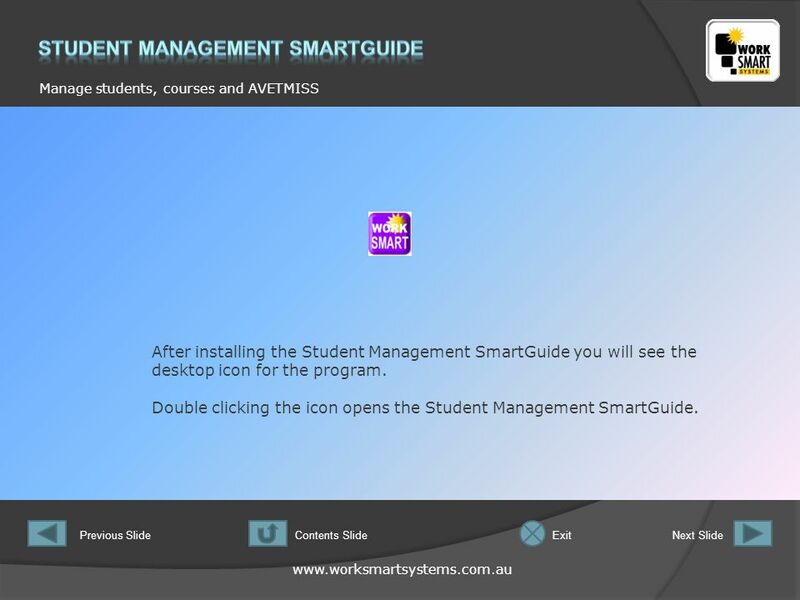 Double clicking the icon opens the Student Management SmartGuide. 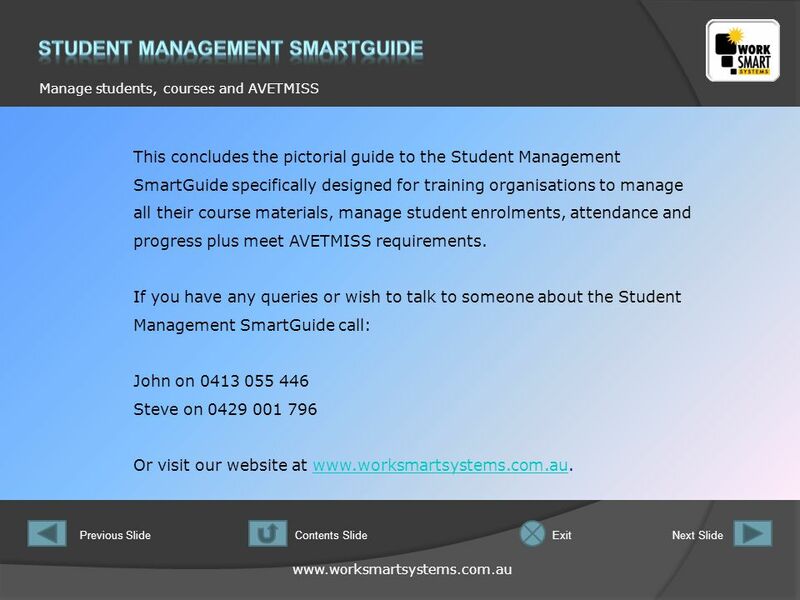 4 www.worksmartsystems.com.au Manage students, courses and AVETMISS Previous SlideNext SlideContents SlideExit This is the Main Menu screen for the Student Management SmartGuide. Lets look at the buttons at the bottom. 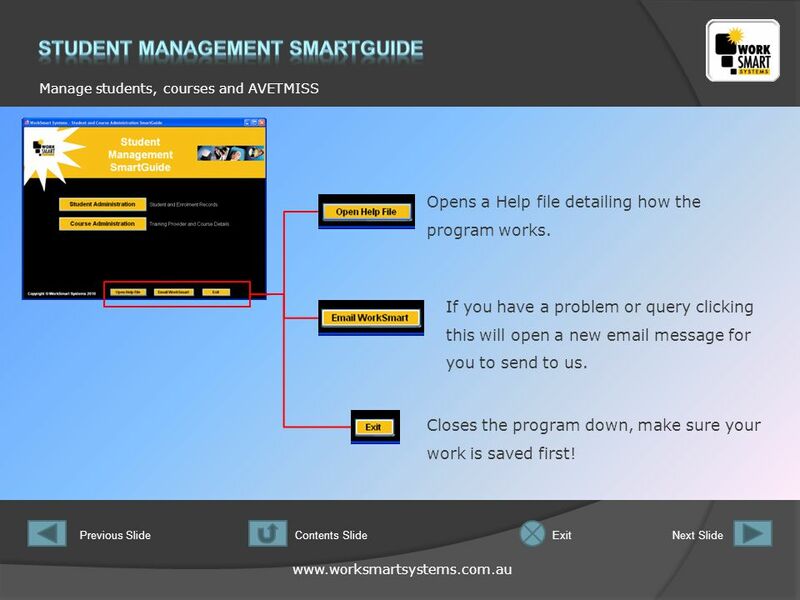 5 www.worksmartsystems.com.au Manage students, courses and AVETMISS Previous SlideNext SlideContents SlideExit Opens a Help file detailing how the program works. If you have a problem or query clicking this will open a new email message for you to send to us. Closes the program down, make sure your work is saved first! 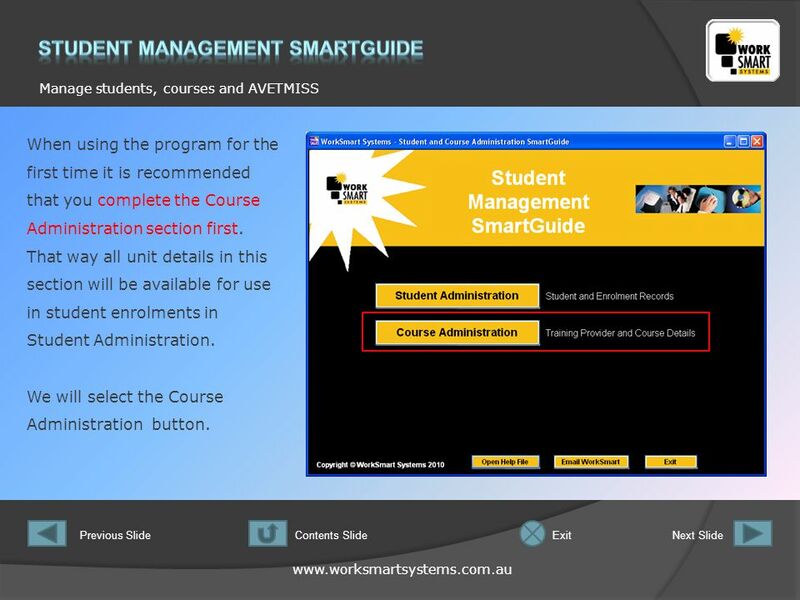 6 www.worksmartsystems.com.au Manage students, courses and AVETMISS Previous SlideNext SlideContents SlideExit When using the program for the first time it is recommended that you complete the Course Administration section first. That way all unit details in this section will be available for use in student enrolments in Student Administration. We will select the Course Administration button. 7 www.worksmartsystems.com.au Manage students, courses and AVETMISS Previous SlideNext SlideContents SlideExit This is the starting form for Course Administration. You navigate by clicking the tabs to move to different data forms. The tabs with top edge in orange are the active tabs. 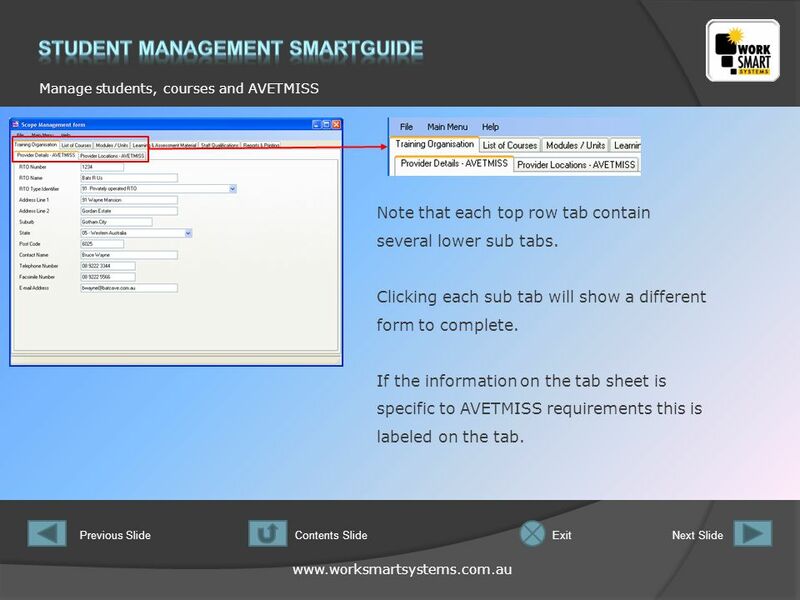 8 www.worksmartsystems.com.au Manage students, courses and AVETMISS Previous SlideNext SlideContents SlideExit Note that each top row tab contain several lower sub tabs. Clicking each sub tab will show a different form to complete. If the information on the tab sheet is specific to AVETMISS requirements this is labeled on the tab. 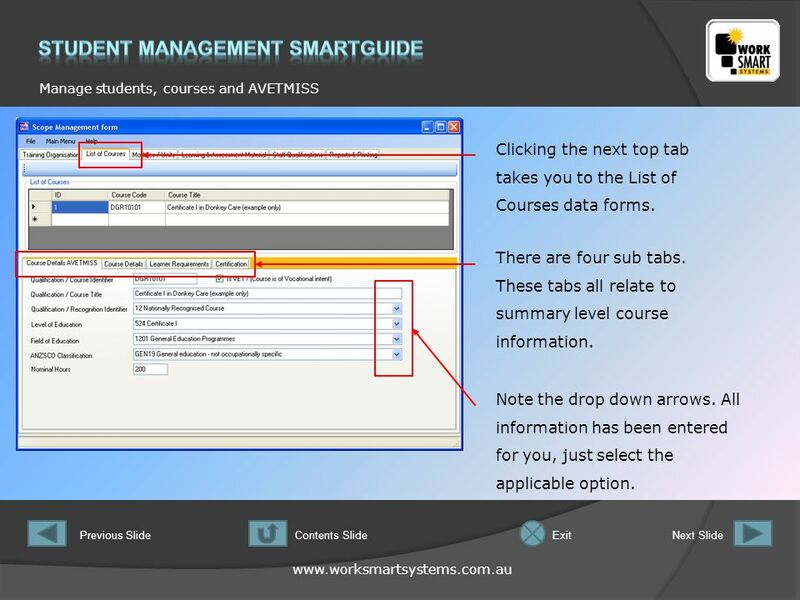 9 www.worksmartsystems.com.au Manage students, courses and AVETMISS Previous SlideNext SlideContents SlideExit Notice the drop down arrows. These contain a selection of choices for you to select from. These are set descriptions by AVETMISS and must be used. 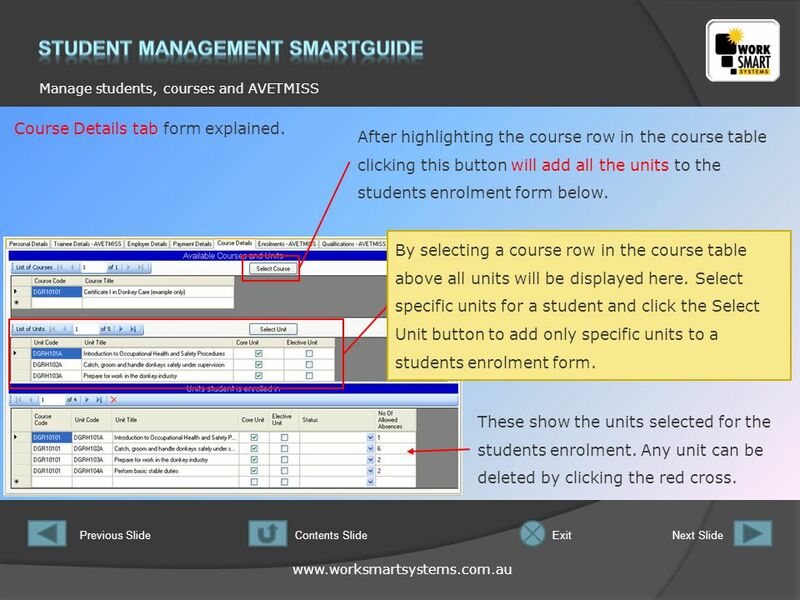 10 www.worksmartsystems.com.au Manage students, courses and AVETMISS Previous SlideNext SlideContents SlideExit Clicking the next top tab takes you to the List of Courses data forms. There are four sub tabs. These tabs all relate to summary level course information. Note the drop down arrows. All information has been entered for you, just select the applicable option. 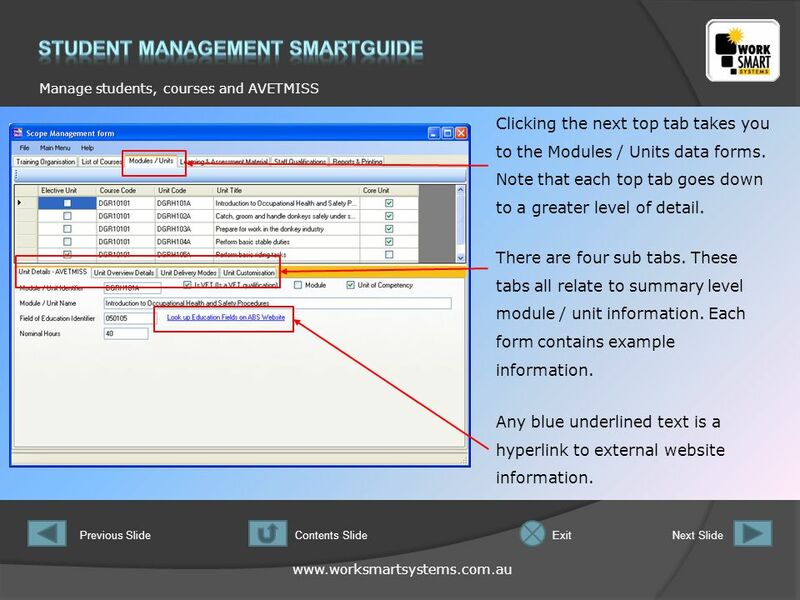 11 www.worksmartsystems.com.au Manage students, courses and AVETMISS Previous SlideNext SlideContents SlideExit Any blue underlined text is a hyperlink to external website information. Clicking the next top tab takes you to the Modules / Units data forms. Note that each top tab goes down to a greater level of detail. There are four sub tabs. These tabs all relate to summary level module / unit information. Each form contains example information. 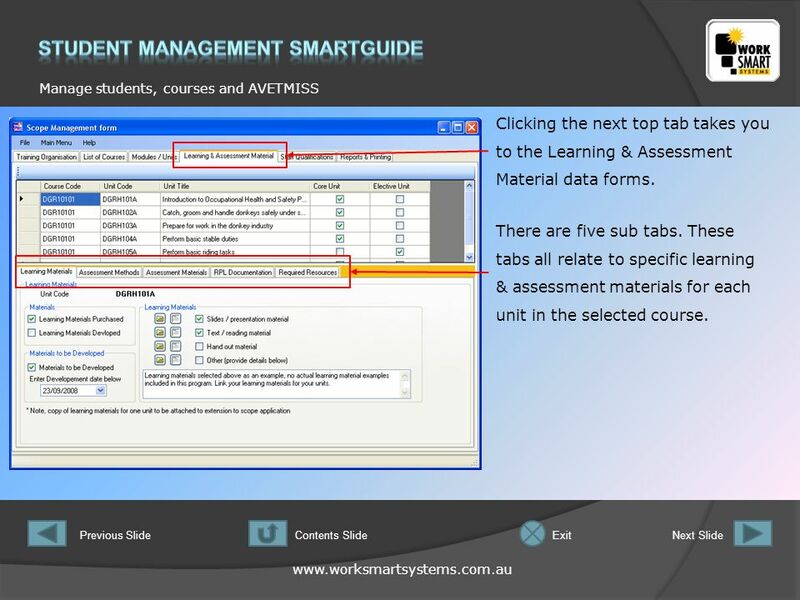 12 www.worksmartsystems.com.au Manage students, courses and AVETMISS Previous SlideNext SlideContents SlideExit Clicking the next top tab takes you to the Learning & Assessment Material data forms. There are five sub tabs. These tabs all relate to specific learning & assessment materials for each unit in the selected course. 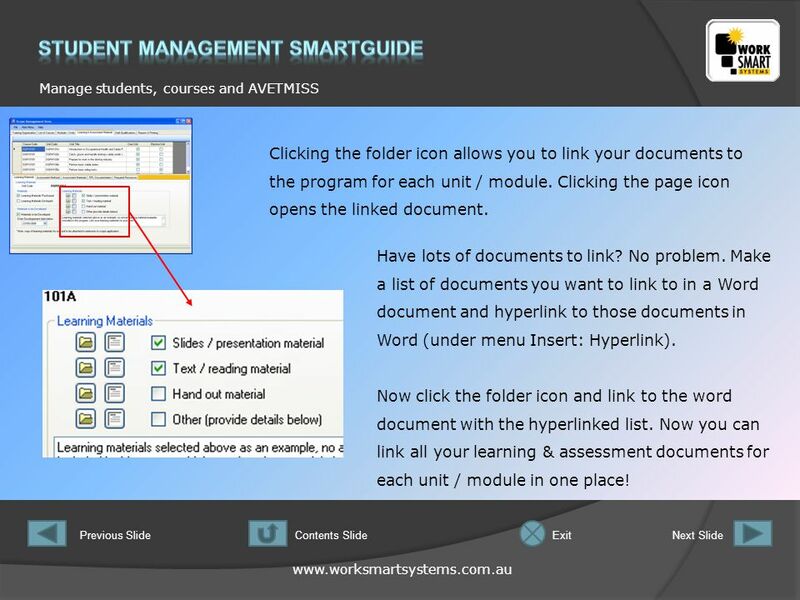 13 www.worksmartsystems.com.au Manage students, courses and AVETMISS Previous SlideNext SlideContents SlideExit Clicking the folder icon allows you to link your documents to the program for each unit / module. Clicking the page icon opens the linked document. Have lots of documents to link? No problem. Make a list of documents you want to link to in a Word document and hyperlink to those documents in Word (under menu Insert: Hyperlink). Now click the folder icon and link to the word document with the hyperlinked list. Now you can link all your learning & assessment documents for each unit / module in one place! 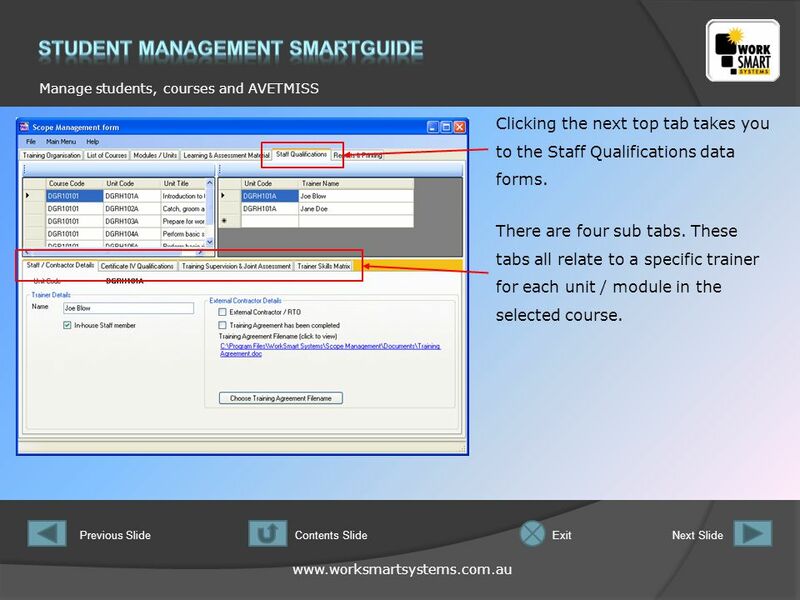 14 www.worksmartsystems.com.au Manage students, courses and AVETMISS Previous SlideNext SlideContents SlideExit Clicking the next top tab takes you to the Staff Qualifications data forms. There are four sub tabs. These tabs all relate to a specific trainer for each unit / module in the selected course. 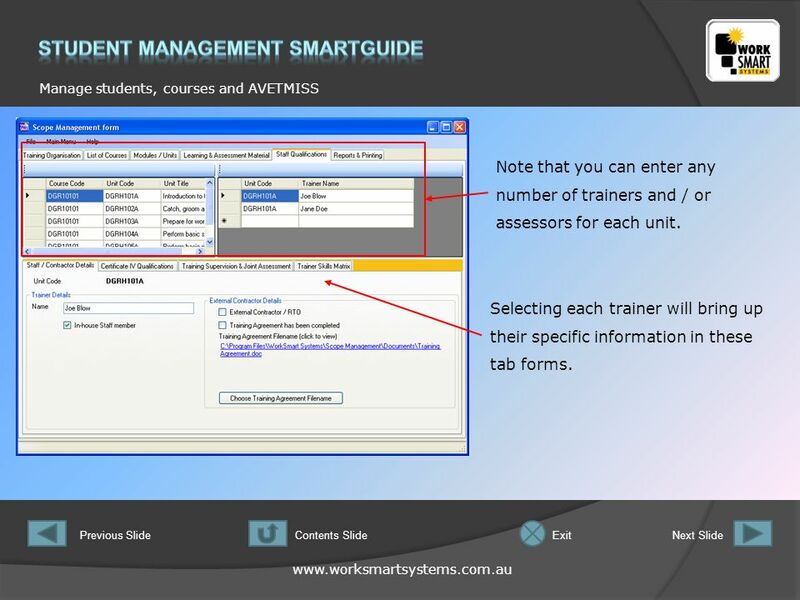 15 www.worksmartsystems.com.au Manage students, courses and AVETMISS Previous SlideNext SlideContents SlideExit Note that you can enter any number of trainers and / or assessors for each unit. Selecting each trainer will bring up their specific information in these tab forms. 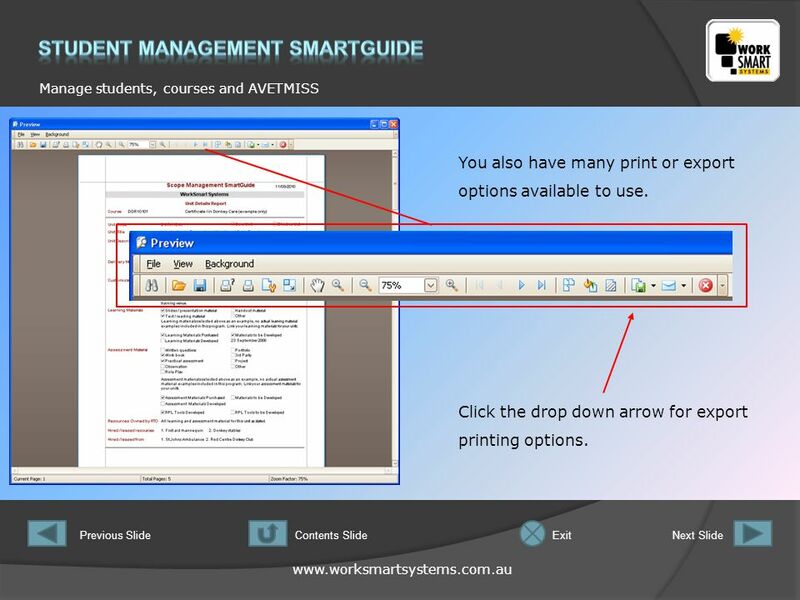 16 www.worksmartsystems.com.au Manage students, courses and AVETMISS Previous SlideNext SlideContents SlideExit The final tab gives you print options. Select your options and click the applicable button to go to a print preview window. Enter your organisation’s name here. 17 www.worksmartsystems.com.au Manage students, courses and AVETMISS Previous SlideNext SlideContents SlideExit You also have many print or export options available to use. Click the drop down arrow for export printing options. 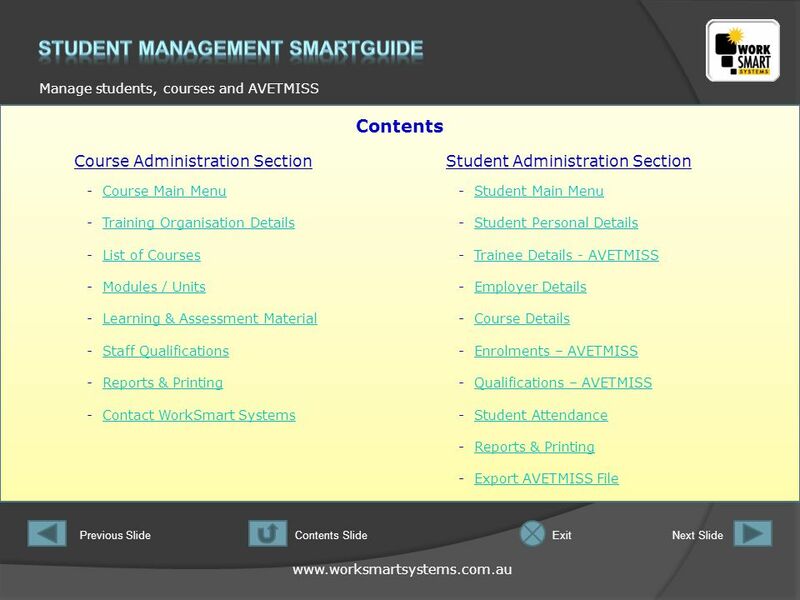 18 www.worksmartsystems.com.au Manage students, courses and AVETMISS Previous SlideNext SlideContents SlideExit With the Course Administration section completed we can now start on the Student Administration section. We will select the Student Administration button. 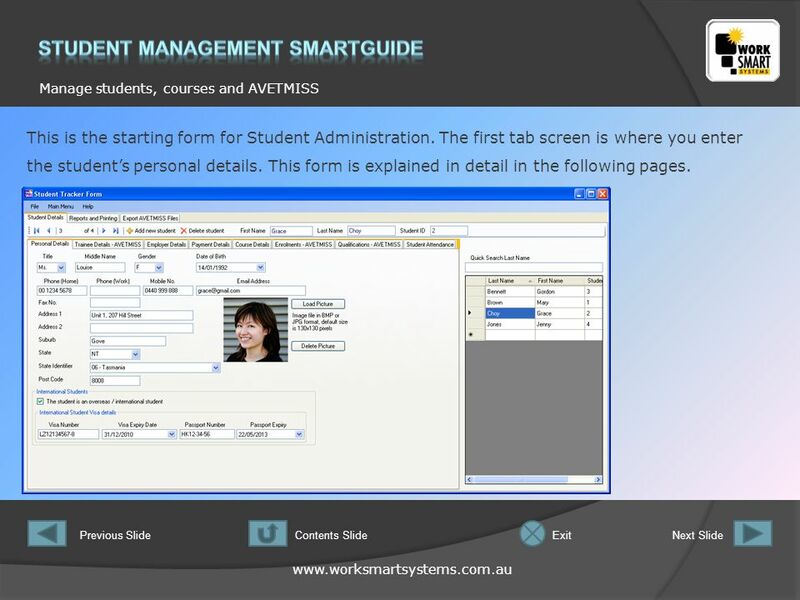 19 www.worksmartsystems.com.au Manage students, courses and AVETMISS Previous SlideNext SlideContents SlideExit This is the starting form for Student Administration. The first tab screen is where you enter the student’s personal details. This form is explained in detail in the following pages. 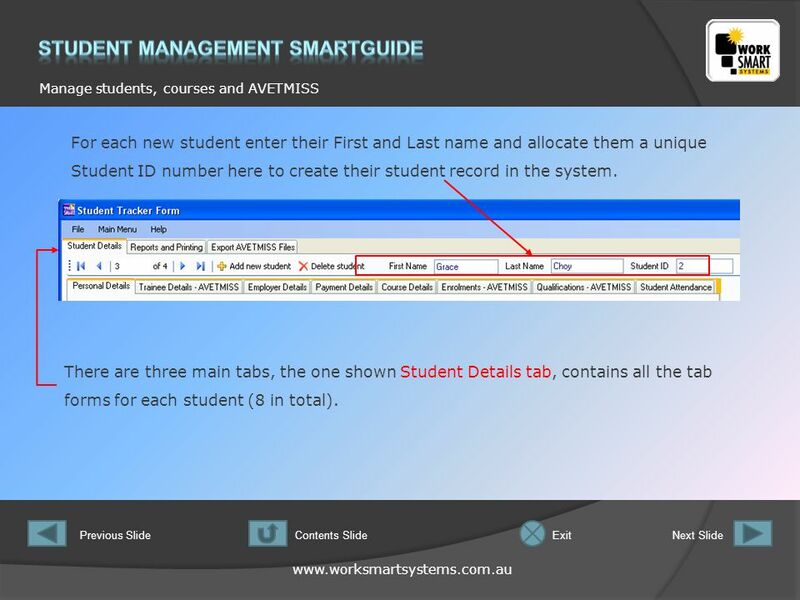 20 www.worksmartsystems.com.au Manage students, courses and AVETMISS Previous SlideNext SlideContents SlideExit There are three main tabs, the one shown Student Details tab, contains all the tab forms for each student (8 in total). For each new student enter their First and Last name and allocate them a unique Student ID number here to create their student record in the system. 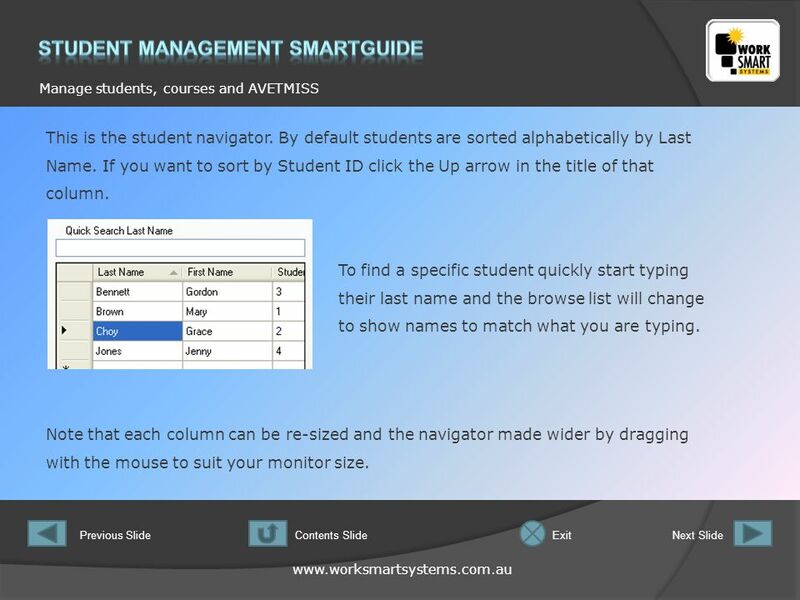 21 www.worksmartsystems.com.au Manage students, courses and AVETMISS Previous SlideNext SlideContents SlideExit This is the student navigator. By default students are sorted alphabetically by Last Name. If you want to sort by Student ID click the Up arrow in the title of that column. Note that each column can be re-sized and the navigator made wider by dragging with the mouse to suit your monitor size. To find a specific student quickly start typing their last name and the browse list will change to show names to match what you are typing. 22 www.worksmartsystems.com.au Manage students, courses and AVETMISS Previous SlideNext SlideContents SlideExit Do you deliver training to international students? If so check the overseas / international student box and these four entry boxes appear to complete the details for the relevant student. Note that if you do not deliver training to international students leave the box unchecked and the four entry boxes will remain hidden. 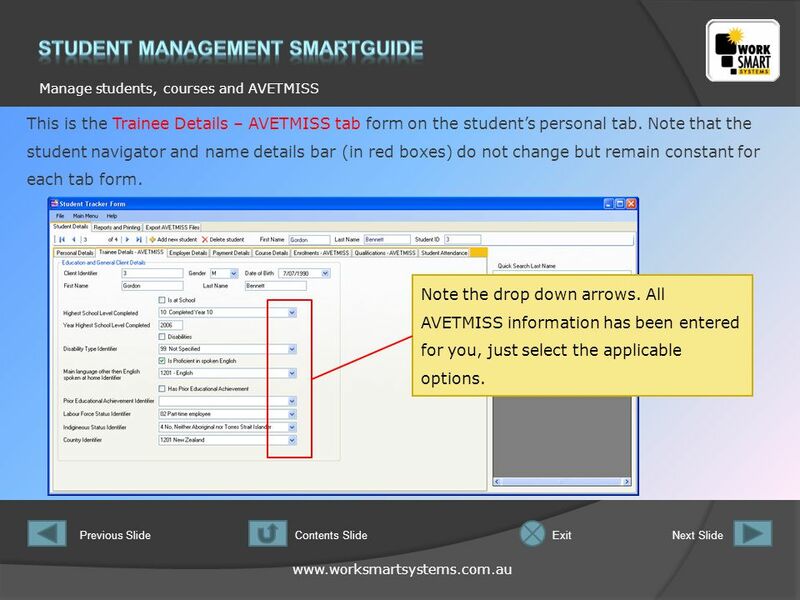 23 www.worksmartsystems.com.au Manage students, courses and AVETMISS Previous SlideNext SlideContents SlideExit This is the Trainee Details – AVETMISS tab form on the student’s personal tab. Note that the student navigator and name details bar (in red boxes) do not change but remain constant for each tab form. 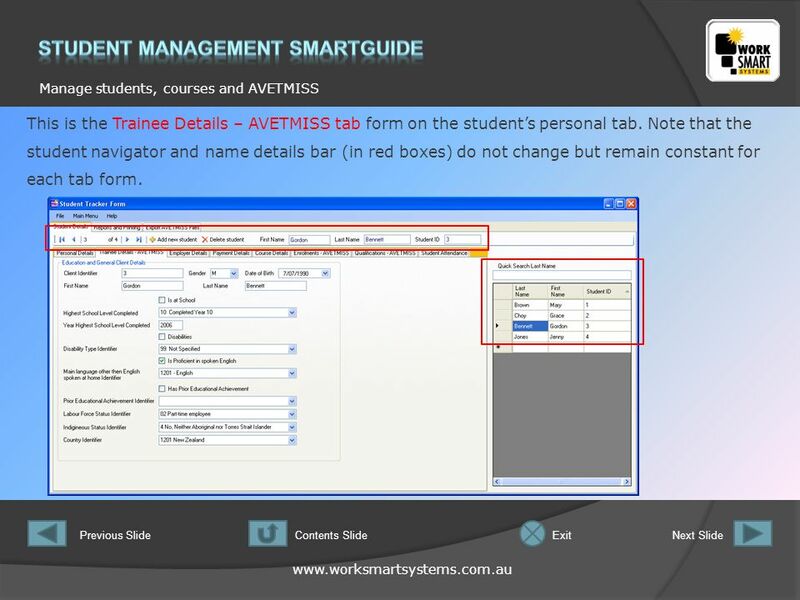 24 www.worksmartsystems.com.au Manage students, courses and AVETMISS Previous SlideNext SlideContents SlideExit This is the Trainee Details – AVETMISS tab form on the student’s personal tab. Note that the student navigator and name details bar (in red boxes) do not change but remain constant for each tab form. Note the drop down arrows. All AVETMISS information has been entered for you, just select the applicable options. 25 www.worksmartsystems.com.au Manage students, courses and AVETMISS Previous SlideNext SlideContents SlideExit This is the Employer Details tab form. Note that there are 2 sub tabs on this form Company Contact and Company Site Visit Details. Record details of any site visits done. If student is an apprentice or has a documented Training Agreement you can link that here. 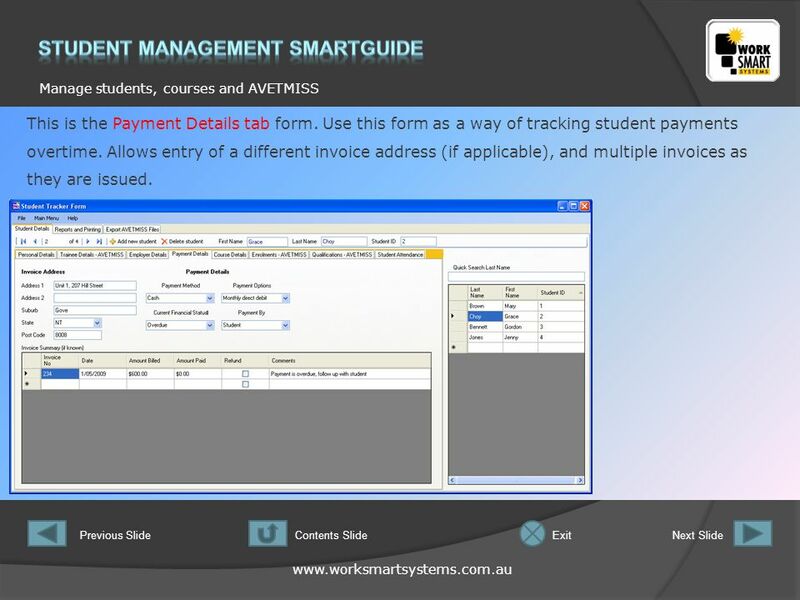 26 www.worksmartsystems.com.au Manage students, courses and AVETMISS Previous SlideNext SlideContents SlideExit This is the Payment Details tab form. Use this form as a way of tracking student payments overtime. Allows entry of a different invoice address (if applicable), and multiple invoices as they are issued. 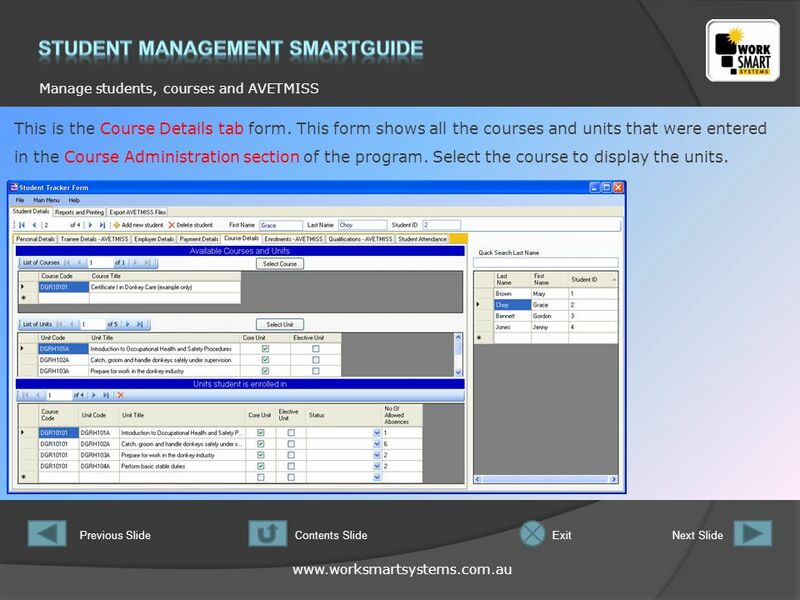 27 www.worksmartsystems.com.au Manage students, courses and AVETMISS Previous SlideNext SlideContents SlideExit This is the Course Details tab form. This form shows all the courses and units that were entered in the Course Administration section of the program. Select the course to display the units. 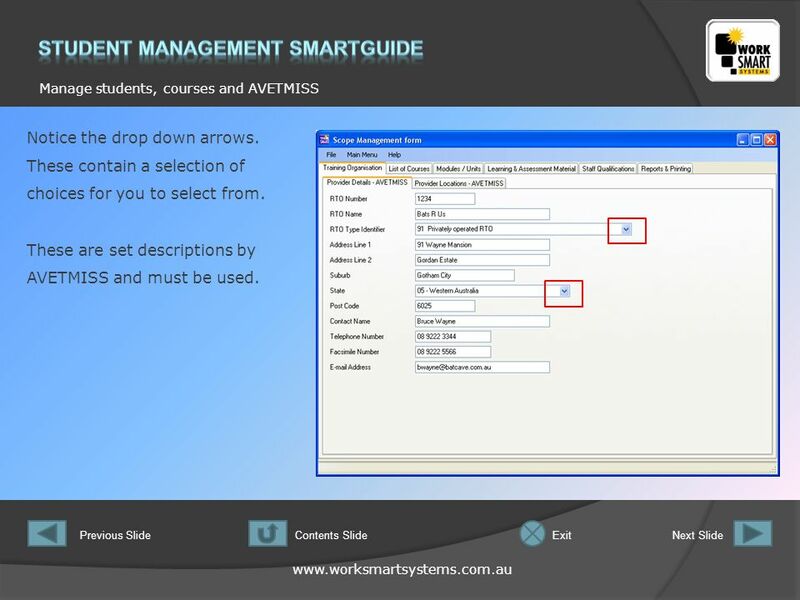 28 www.worksmartsystems.com.au Manage students, courses and AVETMISS Previous SlideNext SlideContents SlideExit Course Details tab form explained. After highlighting the course row in the course table clicking this button will add all the units to the students enrolment form below. By selecting a course row in the course table above all units will be displayed here. Select specific units for a student and click the Select Unit button to add only specific units to a students enrolment form. These show the units selected for the students enrolment. Any unit can be deleted by clicking the red cross. 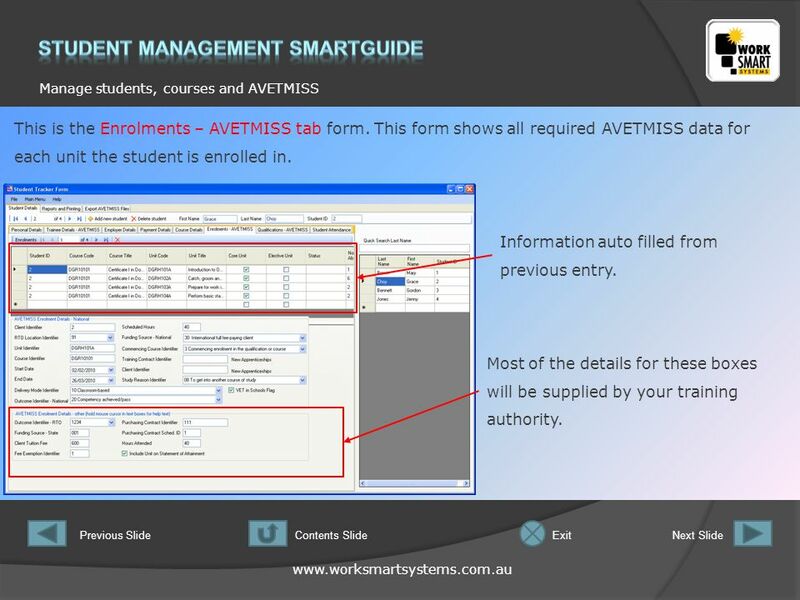 29 www.worksmartsystems.com.au Manage students, courses and AVETMISS Previous SlideNext SlideContents SlideExit This is the Enrolments – AVETMISS tab form. This form shows all required AVETMISS data for each unit the student is enrolled in. Most of the details for these boxes will be supplied by your training authority. Information auto filled from previous entry. 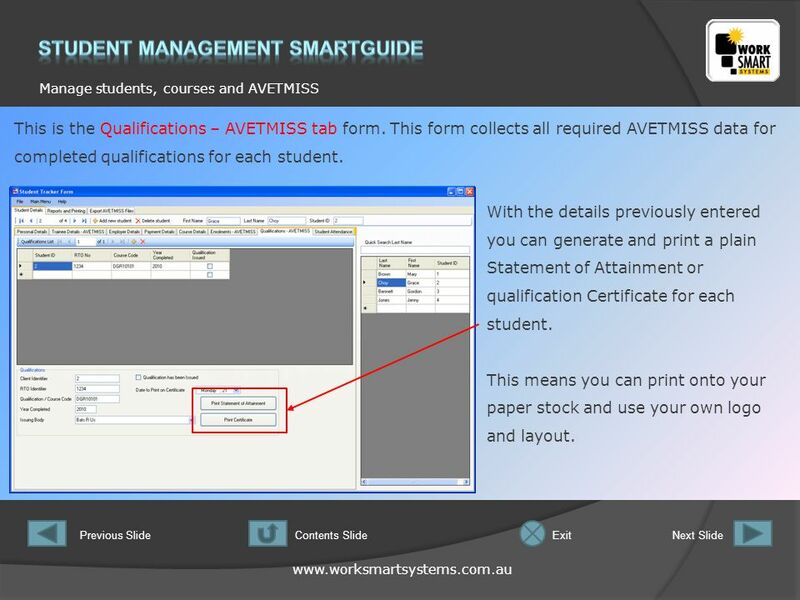 30 www.worksmartsystems.com.au Manage students, courses and AVETMISS Previous SlideNext SlideContents SlideExit This is the Qualifications – AVETMISS tab form. This form collects all required AVETMISS data for completed qualifications for each student. With the details previously entered you can generate and print a plain Statement of Attainment or qualification Certificate for each student. This means you can print onto your paper stock and use your own logo and layout. 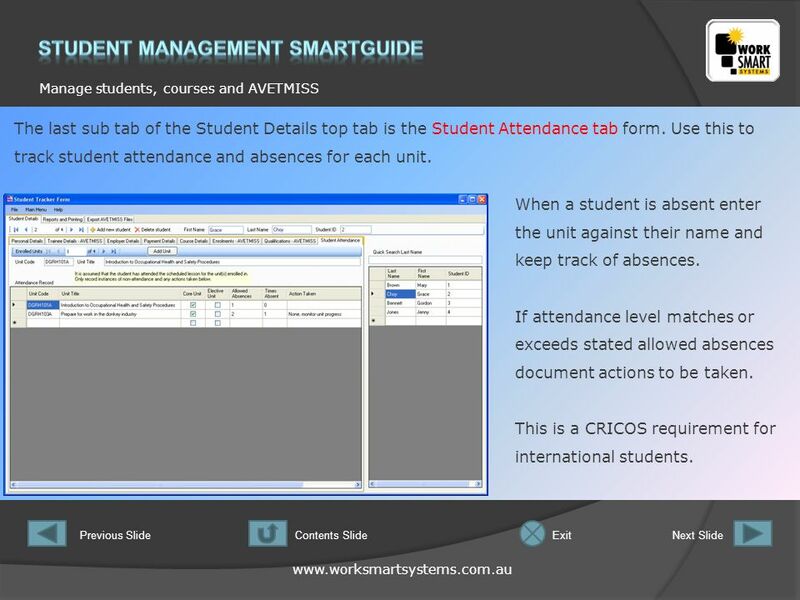 31 www.worksmartsystems.com.au Manage students, courses and AVETMISS Previous SlideNext SlideContents SlideExit The last sub tab of the Student Details top tab is the Student Attendance tab form. Use this to track student attendance and absences for each unit. When a student is absent enter the unit against their name and keep track of absences. If attendance level matches or exceeds stated allowed absences document actions to be taken. This is a CRICOS requirement for international students. 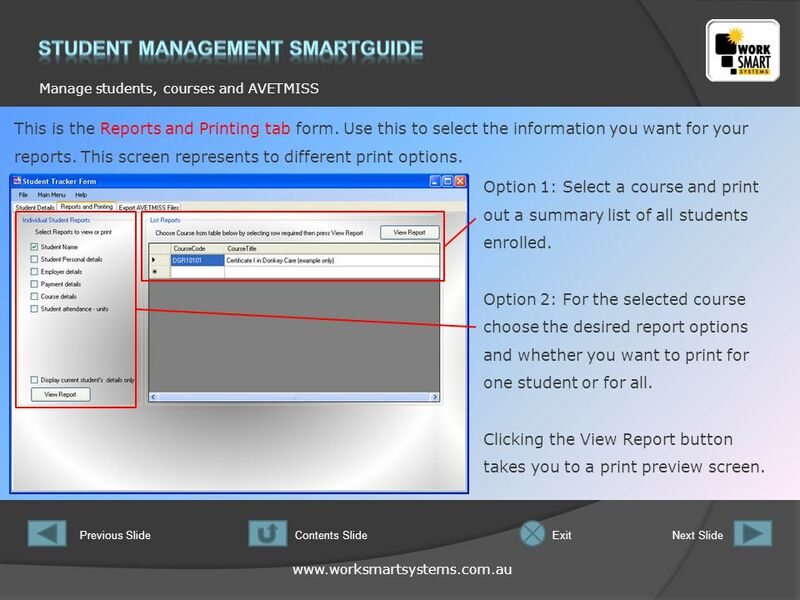 32 www.worksmartsystems.com.au Manage students, courses and AVETMISS Previous SlideNext SlideContents SlideExit This is the Reports and Printing tab form. Use this to select the information you want for your reports. This screen represents to different print options. Option 1: Select a course and print out a summary list of all students enrolled. Option 2: For the selected course choose the desired report options and whether you want to print for one student or for all. Clicking the View Report button takes you to a print preview screen. 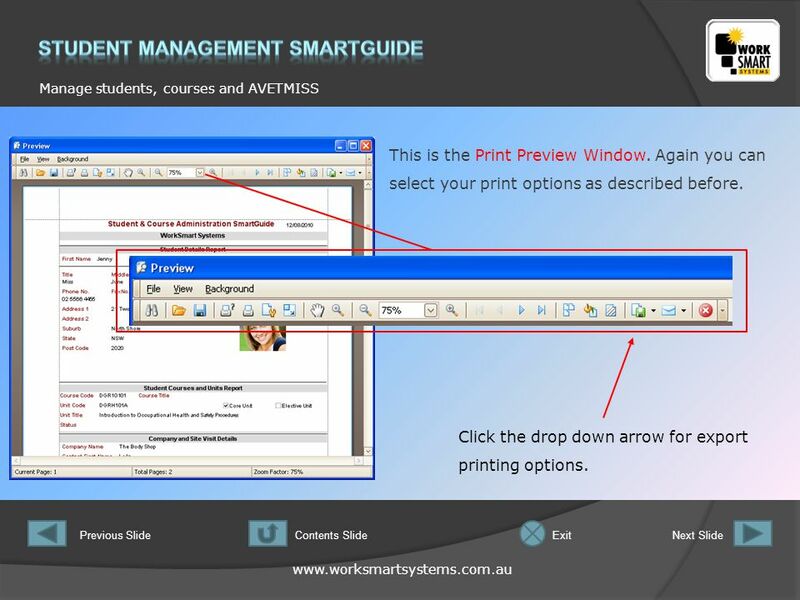 33 www.worksmartsystems.com.au Manage students, courses and AVETMISS Previous SlideNext SlideContents SlideExit This is the Print Preview Window. Again you can select your print options as described before. Click the drop down arrow for export printing options. 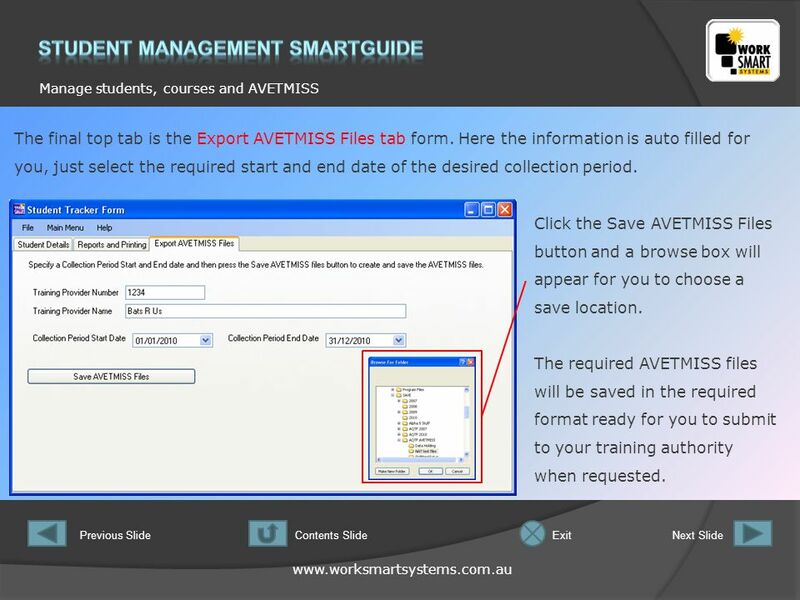 34 www.worksmartsystems.com.au Manage students, courses and AVETMISS Previous SlideNext SlideContents SlideExit The final top tab is the Export AVETMISS Files tab form. Here the information is auto filled for you, just select the required start and end date of the desired collection period. Click the Save AVETMISS Files button and a browse box will appear for you to choose a save location. The required AVETMISS files will be saved in the required format ready for you to submit to your training authority when requested. 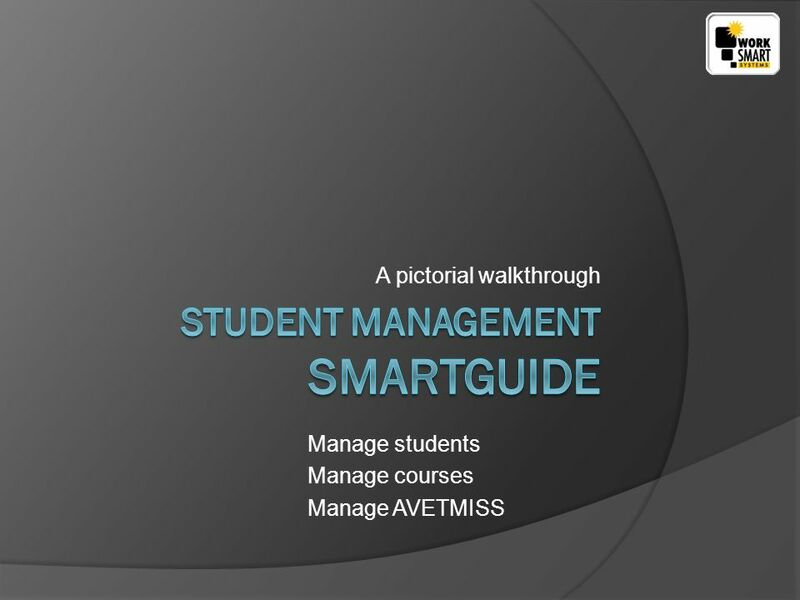 Download ppt "A pictorial walkthrough Manage students Manage courses Manage AVETMISS." Support.ebsco.com EBSCOadmin Branding Tutorial. Welcome to the EBSCOadmin Skinning and Branding tutorial, where you will learn how to customize EBSCOhost. Support.ebsco.com EBSCOhost Digital Archives Viewer Tutorial. Support.ebsco.com Searching the Petroleum Abstracts TULSA ® Database Tutorial. Welcome to eDMR This PowerPoint presentation is designed to show eDMR users how to login and begin using the eDMR system. Database Basics. What is Access? Database management system Computer-based equivalent of a manual database Makes it easy to organize and update information. A pictorial walkthrough. After installing the AQTF 2010 SmartGuide you will see the desktop icon for the program. Double click. A pictorial walkthrough. After installing the NVR Standards SmartGuide you will see the desktop icon for the program. Double. © Paradigm Publishing, Inc Access 2010 Level 1 Unit 2Creating Forms and Reports Chapter 6Creating Reports and Mailing Labels. Making online claims for OCR Nationals A step-by-step guide for centres. Welcome to OpenHouse  The OpenHouse website is located at  It is recommended that this site is viewed at a. A pictorial walkthrough Designed to meet the VRQA Guidelines. Timberline Youth Soccer Association TYSA Coaches Reference Book for Website Use Rev 2 August 2005. Microsoft Office 2010 Access Chapter 1 Creating and Using a Database. 2008 Physiological Measurements Focusing on measurements that assess the function of the major body systems 1. Customer Service Module Course Contents Table of Contents Enter A Request Search A Request Create Invoice (Funeral home request) Search Invoice Manage. Access - Project 1 l What Is a Database? –A Collection of Data –Organized in a manner to allow: »Access »Retrieval »Use of That Data. 1. To start the process, Warehouse Stationery (WSL) will invite you to use The Warehouse Group Supplier Electronic Portal and will send you the link to.